Higher National Diploma (HND) in Information Technology is offered by Sri Lanka Institute of Advanced Technological Education (SLIATE). The SLIATE is a government educational institution for higher education coming under the purview of Ministry of Higher Education, Sri Lanka. Compared to other technical education courses in Sri Lanka, recognition for these courses is higher as these institutes are managed manged under Ministry of Higher Education, Sri Lanka. After completion of this Higher Diploma you can register for other IT degree courses. HNDIT holders can get subject exemptions for following degree programs. Degrees awarded by Barcllay and Lincon Universities. With HNDIT and 2 Years Experience you register for a M. Sc. degree. SLIATE also offers several other HND courses such as Accountancy, Business Administration, Business Finance, English and Agriculture. HNDIT is a 6 semester (3 Year) course conducted in English medium. You get NVQ Level 6 qualification after this HNDIT course. 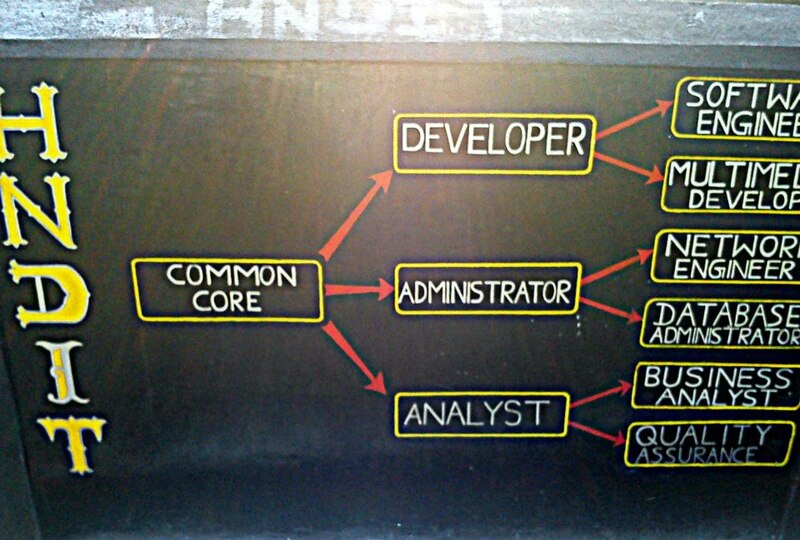 Three Specialization Paths: Developer, Administrator and Analyst. The Entire program is divided into 3 specialized paths: Developer, Administrator and Analyst. After first year, student can select one of these three pathways to study and become a specialist in that particluar field. No. 42, Rodrigo Place, Colombo 15. No. 16, Keppetipola Rd., Kandy. No. 665/5,Beach Rd., Guru Nagar,Jaffna. Hardy Advanced Technological Institute, Ampara. Advanced Technological Institute , Kegalle. You can contact AITs listed above to get more details.